Michael Knight is a Boomer and he fits well within the general description. As one of 76 million Boomers and the largest generation in history, he feels that their experiences have created a dedicated, America-loving generation with a strong commitment to service. He was an Eagle Scout who went to college on a golf scholarship and then transitioned into the world of Wall Street working for Merrill Lynch. Both he and his wife have maintained memberships at several golf courses over the years, mostly in the Denver area since they moved here in 1979. Michael never thought of his large list of golf buddies as a business asset until quite recently. He has been in the business of matching startup entrepreneurs with angel investors for the past five years. At his wife’s suggestion, he called his golf buddies to see if they were active in funding startups and it turns out that they were! These guys look for a better return on their investments and are willing to take some risks with their money to get it, especially with retirement fast approaching. Michael takes full advantage of his home in Denver, the fastest growing technology city in the US. He regularly visits all 19 startup incubators in the area to listen to entrepreneurs pitch their ideas and answer questions. His intention is to choose the best projects and introduce the participants to the appropriate investors who are often the very Boomers he knows from the golf course. These Boomers are affluent angel investors at events where startups are pitching. Michael tries to match entrepreneurs with capital and is hoping to meet more investors at the Denver 4GenNow Power Partner Summit. Since investors are very specialized and tend to be very focused and singular in their investments, he says you can never know too many. Michael is looking forward to the pitches and meeting new investors to be matched with entrepreneurs he represents. He feels an obligation to find funding for these entrepreneurs and get them going wherever that money is supposed to take them. He is working with four times as many entrepreneurs as investors at any given time. Denver is one of the hot markets for Millennials and Michael says it took him about three seconds to agree to participate in this first-of-its-kind event. He’s excited that Denver is in the hot seat right now and he truly loves Colorado and all it has to offer, both for business and outdoor activities. 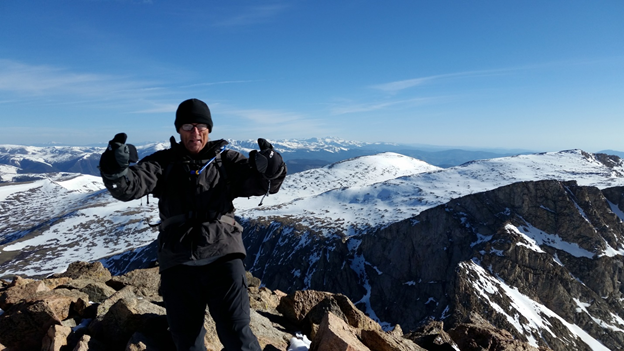 His current passion is climbing each of the 100 highest peaks in Colorado, known as the Centennials, and he is currently only two peaks shy of meeting this goal.